Models walk the runway during the Chanel Cruise 2018/2019 Collection show at Le Grand Palais on May 3, 2018, in Paris. This May was a pretty major month; we witnessed a royal wedding, saw several red-carpet takeovers at Cannes, got real about mental health for Mental Health Awareness Month and even managed to end the month with some rap beef. But in the world of fashion, May marks the debut of the cruise collections—an occasion that doesn’t exactly merit its own week but is worth taking note of nonetheless. What is a “cruise collection,” you ask? Well, it used to be exactly what it sounds like: a collection designed to be worn while vacationing, generally during the winter months, which is when these collections land at retailers. However, in recent years, cruise collections have become our holdover between the debut of the year’s Fall/Winter collections in February (followed by the markdown of the previous year’s Fall/Winter clothing in the spring), and the arrival of next year’s Spring collections in September. In short, for fashion houses that can afford the expense of another show—and their well-heeled clientele who can afford to travel year-round—it’s a way to keep their closets current, and their wallets open. 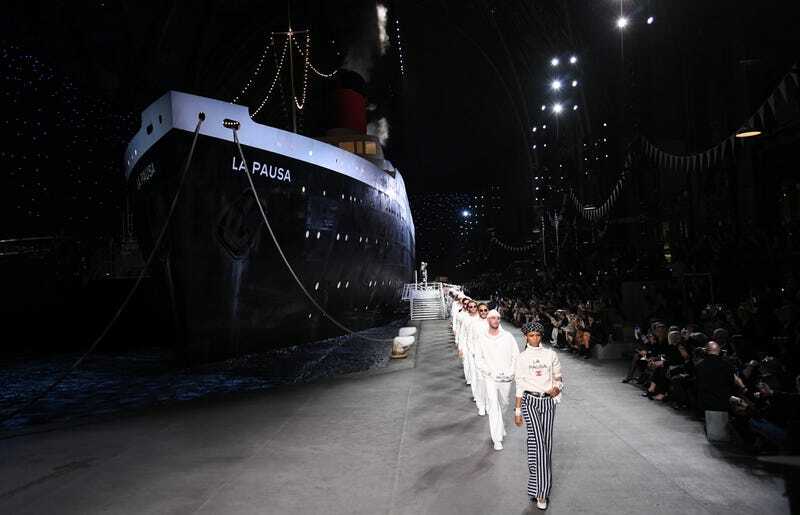 This May, as labels throughout the industry revealed their resortwear, three of France’s major luxury houses—Chanel, Dior and Louis Vuitton—showcased their cruise collections in three dramatically different ways. And because we love to see how the other half lives—and vacations—we thought we’d take a cruise through the collections to see how each of these labels approached midseason dressing. Fun fact: We love a beret. And there was no shortage of them at Chanel’s showing May 3, staged in front of a custom-built cruise ship at Le Grand Palais in Paris. As always, Chanel’s collection typified French-girl chic with an array of the house’s trademark tweeds, stripes and wide-legged trousers, paired with white patent leather Mary Janes and occasional nods to La Pausa, Coco Chanel’s estate on the French Riviera. The color palette was classic Chanel, as well—primarily black and white, with pops of powder blue and pink, giving the collection a whimsical, occasionally girlish charm. A model walks the runway during the Chanel Cruise 2018/2019 Collection show at Le Grand Palais on May 3, 2018, in Paris. Models walks the runway during the Chanel Cruise 2018/2019 Collection show at Le Grand Palais on May 3, 2018, in Paris. Karidja Toure attends the Chanel Cruise 2018/2019 Collection show at Le Grand Palais on May 3, 2018, in Paris. Mette Towley attends the Chanel Cruise 2018/2019 Collection show at Le Grand Palais on May 3, 2018, in Paris. Steve McQueen and a guest attend the Chanel Cruise 2018/2019 Collection show at Le Grand Palais on May 3, 2018, in Paris. Zita Hanrot attends the Chanel Cruise 2018/2019 Collection show at Le Grand Palais on May 3, 2018, in Paris. Kilo Kish attends the Chanel Cruise 2018/2019 Collection show at Le Grand Palais on May 3, 2018, in Paris. Dior’s show May 25 was perhaps the most dramatic because it took place outdoors during a downpour in Chantilly, France. While the guests thankfully remained covered by tents, the models braved the elements in a decidedly romantic collection inspired by the Mexican female rodeo riders called escaramuzas, who wear beautifully embellished dresses and sombreros while performing stunts on horseback, as several did during Dior’s show. The collection riffed heavily on Dior’s legendary “New Look” silhouette as well as the equestrian theme, with full, midlength skirts and nipped waists throughout. Lace, embroidery, layers of tulle and a jungle-inspired toile were the perfect counterparts to the combatlike boots and sneakers tromping down the runway, while corsetlike belts punctuated most looks—along with stylish fedoras, which came in handy, given the weather. A model walks the runway during the Christian Dior Couture S/S19 Cruise Collection show on May 25, 2018, in Chantilly, France. Model walk the runway during the Christian Dior Couture S/S19 Cruise Collection show on May 25, 2018, in Chantilly, France. Tina Kunakey attends the Christian Dior Couture S/S19 Cruise Collection show on May 25, 2018, in Chantilly, France. Alexandra Shipp attends the Christian Dior Couture S/S19 Cruise Collection show on May 25, 2018, in Chantilly, France. The Louis Vuitton woman is looking toward the future—in visorlike glasses—or so the label’s 2019 cruise collection would indicate. In Saint-Paul de Vence, France, on May 28, models walked through the garden maze of sculptures that make up Joan Miró’s Labyrinthe. A model walks the runway during the Louis Vuitton 2019 Cruise Collection show at Fondation Maeght on May 28, 2018, in Saint-Paul de Vence, France. A model walks the runway during the Louis Vuitton 2019 Cruise Collection show at Fondation Maeght on May 28, 2018 in Saint-Paul de Vence, France. Camelia Jordana attends the Louis Vuitton 2019 Cruise Collection show at Fondation Maeght on May 28, 2018, in Saint-Paul de Vence, France. Luka Sabbat attends the Louis Vuitton 2019 Cruise Collection show at Fondation Maeght on May 28, 2018, in Saint-Paul de Vence, France. Sienna Miller and Ruth Negga attend the Louis Vuitton 2019 Cruise Collection show at Fondation Maeght on May 28, 2018, in Saint-Paul de Vence, France. Edward Enninful and Grace Coddington attend the Louis Vuitton 2019 Cruise Collection show at Fondation Maeght on May 28, 2018, in Saint-Paul de Vence, France. Laura Harrier attends the Louis Vuitton 2019 Cruise Collection show at Fondation Maeght on May 28, 2018, in Saint-Paul de Vence, France.